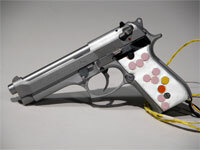 The smart gun project has been on the move for years, and in a little over a year they expect it to be commercial ready. New Jersey has already passed a law stating that after three years have passed since the availability of smart guns, that no retailer or manufacturer will be able to sell a gun unless it has a way to be personalized. That is, be able to identify the rightful owner(s). Working towards the completion of research and testing for the smart gun will be made possible through a grant of $1.1 million by the US Department of Justice. could lead to many other devices with the same embedded technology.